MPPEB Vyapam Sub Engineer 2018 | Apply Online Form | Last Date Extended : 12 August 2018 Madhya Pradesh Professional Exam Board MPPEB Vyapam has released the job notification for the MPPEB Vyapam Sub Engineer 2018 on 27 July 2018 to fill the Application Form. 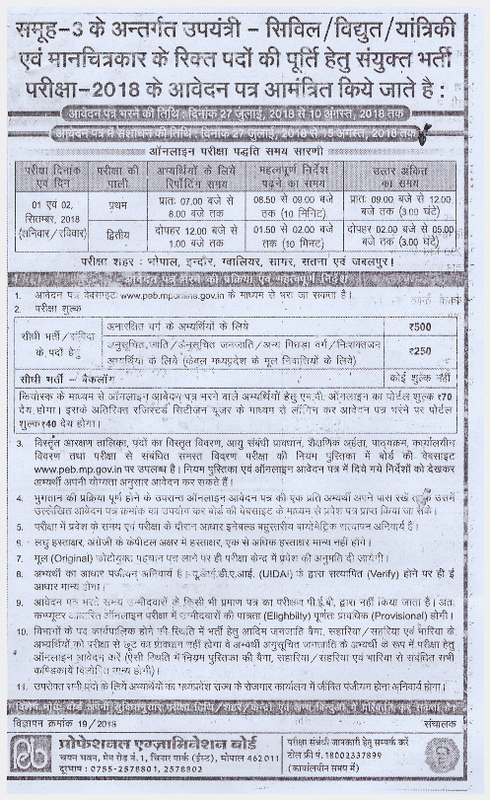 Eligible candidates may apply online from 27 July 2018 to 10 August 2018 through peb.mp.gov.in. Interested candidates can read this article to find the details about Important dates, Eligibility Criteria, Fee structure, Vacancies Details and more. Eligible Candidates can apply for MPPEB Vyapam Sub Engineer 2018. The application procedure is very simple Candidates need to visit the official site and follow all required instruction. Important link of MPPEB Vyapam Sub Engineer 2018 are given below.